May 16, 2012 – HAYS Cleaning, Inc. is pleased to announce the “Helping Our Heroes” Past and Present Special! This event honors Memorial Day, and the many Americans who served in the United States Armed Forces, as well as recognizing Independence Day and the men and women who continue to protect our freedoms today. In recognition of Memorial Day, HAYS Cleaning will provide a complimentary residential cleaning for Veterans of the United States Military, spouses of active servicemen and parents of veterans or servicemen. This complimentary service will include up to three (3) hours of residential housecleaning. Supporters will be listed on the “Helping Our Heroes” website, sponsored by HAYS Cleaning, at http://www.helping-our-heroes.com. Roberts Road Bible Church is a “Light House,” located at 8419 S. Roberts Road, Justice, IL 60458. People from various backgrounds come here to be touched by the “Hero’s Hand.” For more information on the church, please call 708-598-2330 or visithttp://www.rrbchurch.org. HAYS Cleaning Inc. was established in 1979 and has grown from a hobby of owner/operator Mary James. The people at HAYS Cleaning want to make a difference, not just do a job! We believe liking what you do for “a living” delivers results our clients see and value. HAYS Cleaning, Inc. is located at 9428 S. 78th Ct., #3, Hickory Hills, IL 60457. 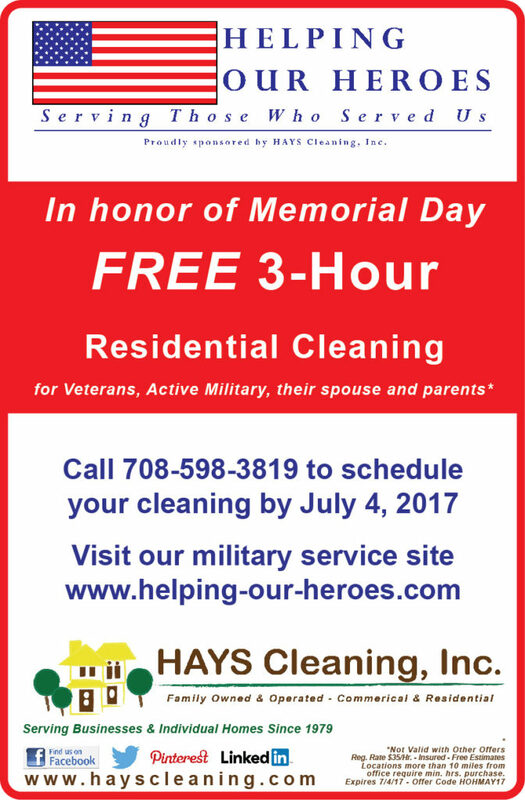 For more information on the “Helping Our Heroes” offer or the Care Packages, please call 708-598-3819, visit www.hayscleaning.com or email mary@hayscleaning.com.